In a previous article I discussed that I use S&P 500 as my benchmark for dividend returns and total returns. One of the drawbacks of this comparison is the fact that sometimes the composition of the index is out of sync with the composition of a typical dividend growth portfolio. 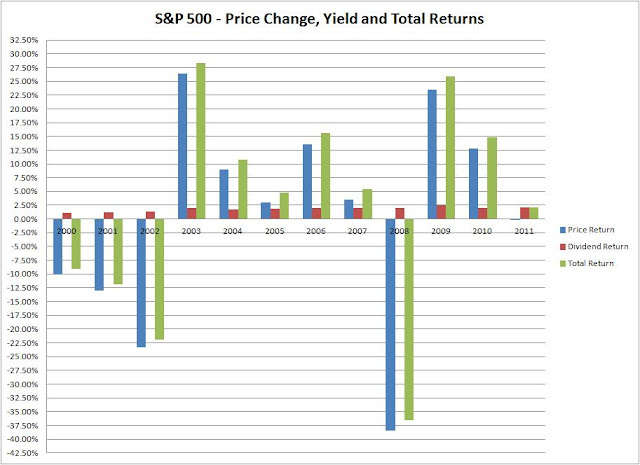 For example, in the late 1990’s and early 2000’s, technology stocks which paid no dividends were added to S&P 500, which diluted the yield. In 2008 and 2009, a large portion of financial companies cut or eliminated distributions, months before the market started crashing. For example, Citigroup (C) cut its dividend in January 2008, while the market was still close to multi-year highs. As part of my strategy, I usually sell when a stock I hold cuts or eliminates distributions. However, using data from the S&P 500 as a proxy for the stock market, one can still draw valuable conclusions about dividend investing in general. Recently, the stock market had its best quarter since the late 1990s. Currently, stocks are close to some of the highest levels since 2008. However, stock index investors have seen the value of their equities barely register any capital gains since 2000. At the same time, prices have oscillated wildly, falling from 1500 on the S&P 500 to less than 800 two times over the past twelve years. Investors who were relying on large-cap US stocks at the beginning of the new millennium, have depleted a large portion of their portfolios, as they sell stocks to pay expenses. While prices have mostly remained flat, earnings and dividends have increased. Companies in the S&P 500 earned $48.17 and paid $16.69 in dividends in 1999. In 2011, companies in the S&P 500 earned $86.55 and paid $26.43 in dividends. As a result, As a result, the P/E ratio has decreased from 30.50 in 1999 to 14.50 in 2011. During the same time period, the dividend yield has increased from a paltry 1.14% to a slightly more respectable 2.10% in 2011. As mentioned previously, the reason for the low yield is the fact that not all companies pay dividends and the fact that several of the ones that do, distribute small amounts of earnings. When you look at the annual returns since 2000, one could see that annual returns have ranged from a 26% increase in 2003 to a 38% decrease in 2008. 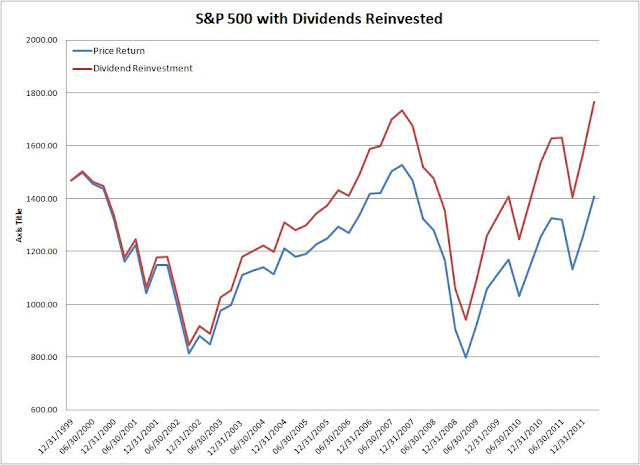 One fact that illustrates the allure of dividends is that investors kept getting paid for holding on to their stocks. In fact, the reason why so many investors are increasingly embracing dividend investing is the fact that they are receiving a positive return on investment every year, no matter where the market goes. With the right selection criteria in mind, investors could easily designate a portfolio that provides a sufficient stream of dividend income to meet their expenses in any market environment, without having to sell shares.